This time around we would like to represent you with Tesco’s history and the key happenings which all played a large role in the brand to become as big as it is today. Tesco is one of the leading commercial brands in the world and it’s among the Nr.1 market leaders in Europe. Let’s see where its success lies if we look back in history. 1919: The official date of Tesco’s founding by Jack Cohen who has started history by setting up a few stalls to sell its products in a London marketplace. 1924: The official induction of Tesco as a brand name. The name derives from the name of Cohen’s first tea supplier (T.E Stockwell) and the adding of the first two characters of Cohen’s last name and the name Tesco is born. 1931: The opening of the first real store under the name Tesco in Middlesex, Edgware. 1956: The first self-service Tesco supermarket opens in St. Albans. 1961: Tesco is the one and only grocery store which has been inducted in the Guinness Book of world records by opening the largest ever supermarket ( hypermarket) in the world. 1984: The year when the first online shopping transaction happens in the UK. Tesco has the most profitable online shopping system among grocery and commercial stores of its kind ever since. 1987: The brand makes its largest ever acquisition by buying out Hillard’s grocery store chain which means the acquisition of 40 stores in the same time. 1994: Tesco expands to Scotland by buying out the largest local grocery store chain called William Low with its 57 stores. 1995: The year when Tesco introduces its Clubcard system which had been virtually unknown before. 1995: large expansion starts with Poland being the first European country where Tesco opens its hypermarket outside of the UK. 2003: The first Tesco store opens in Japan. 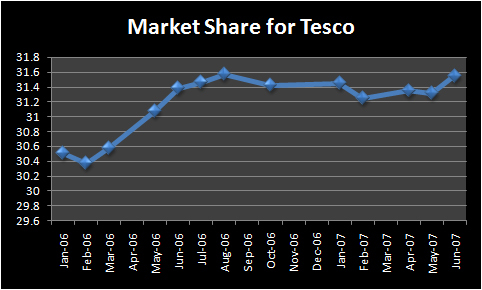 2006 – 2013: Tesco tries to conquer the US market under the brand name Fresh and Easy. The plan fails to become successful and Tesco withdraws in 2013. 2013: Opening of the first Tesco Family Dining restaurant in the UK. 2014: Due to the economic crisis Tesco is forced to close 57 of its UK stores alongside the Tesco Family Dining restaurants. 2015: Instead of expanding Tesco starts to diversify its stores to get closer to a larger number of people’s needs. Today Tesco continues its diversification project throughout the whole European and Asian markets and it also continues its expansive politics, though not as dynamically as it used to be. Regardless the brand also releases new products and has also started to sell its first range of bio-products, to appeal to all those who are following a healthier lifestyle. Tesco’s official website has all the information on the products and its stores’ whereabouts all over the world. Check it out if you would like to learn more about the brand. If you have any specific request, information or inquiry call the regional Tesco contact number.